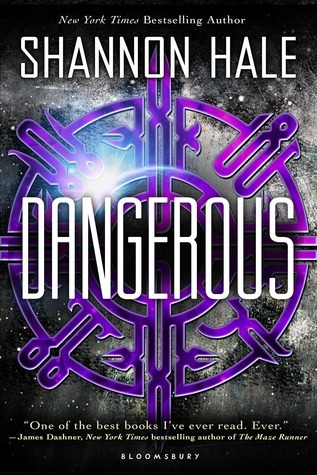 Equal parts romance and action-adventure (Okay, so I have a sort of idea), this explosive story is sure to leave both longtime Shannon Hale fans and avid science fiction readers completely breathless. You get two blurbs this time because the one from Goodreads (also the one on the author page) was so vague that I thought there must be more information somewhere. (Not much.) So, the verdict. Blurb #1 could go on the cover of pretty much any evil plot book. Just change the character name. It's full of stock phrases and vague descriptions that are probably aimed to create mystery. Instead, they create confusion and make me wary of picking it up. What's it even about!? The second blurb provides more clarity. This is science-fiction, obviously, so we know what to expect there. And....that's about it. Both blurbs try to stick the romance in there like it's just as important as SAVING THE EARTH, which worries me. It feels forced. I also really need to know why this chick is the only hope. Is she the only one who knows about it? Does she have some special ability? Why do we need to know that she's from Salt Lake City? Is that the spawning ground of "regular" girls? I admit, I'm being harsh, but I just don't understand how marketing copy like this get out. For all I know (and given the glowing pre-reviews and author testimonials), this could be one of the best books of the year. I'll be waiting to read reviews on other blogs because I'm wary to spend $15.99 on a story that, for all I know, could be about a plague of unruly mecha-rabbits. The blurbs don't really grab me. It's the author that makes me want to pick up the book. I've read other books by her and while I didn't love all of them, I didn't hate any of them either. I do wonder what is so special about Maisie. A normal girl being the only hope for Earth? Ehhh...come on, there HAS to be something special about her! Maybe she's half alien! Area 51 is in the next state over! Okay, so now my imagination is just going wild. I recently read some reviews that make me think I won't want to read it, but I hope you like it. I've never actually read Shannon Hale, so perhaps I'm missing out. I guess she's one-armed and has a robot arm in its place. That's all I know. Haha, half alien would be awesome. Glad to help! I'm curious about the reviews too. The ones that I've seen so far have been very mixed.